All the latest news, guides and content about Pengur! Last week, I announced my decision to take a “break” in order to decide which private server(s) I will be continuing my journey on. After lots of thought and changing my mind, I have made my decision! As of today, I will be blogging about SuperCPPS, Vintage Penguin and Pengur! SuperCPPS is a private server which is a combination of custom parties, Club Penguin content and even Club Penguin Island content. It has custom catalogs, parties, rooms, quests and so much more, and I’ve really been enjoying it! You can play it in English, though some bits still need to be translated from Spanish, here. Q: Is it family friendly? Use of inappropriate language is strictly against the rules and the game contains filters to ensure this, though they currently aren’t the most effective for the English version. Almost all of the content is family friendly, though there may be the occasional thing which may be questionable, yet I still deem it to be relatively family friendly. Q: Do they have a “shady” past? Previously, they have stolen content without permission from Club Penguin Rewritten and Pengur, but I don’t believe this has happened recently. They also suffered from a database breach, but as far as I am aware, they have improved security and there hasn’t been a breach in almost a year. I would still reccommend taking precautions, as with any CPPS, to keep yourself secure, which I will talk more about soon. Q: What’s the next “big thing” on SuperCPPS? A huge event called “Rockhopper’s Quest” just concluded, and it was really fun with lots of challenging activities! 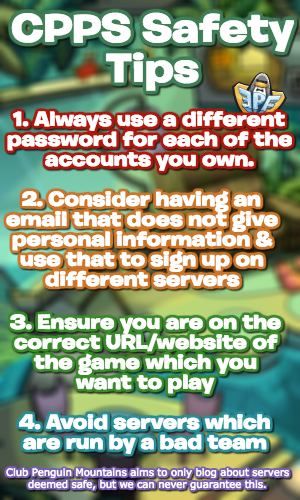 However, the Puffle Party will be beginning on March 23rd! Q: What is Vintage Penguin? 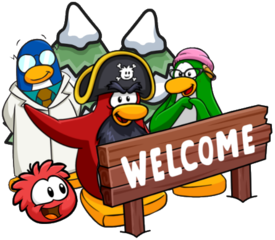 Vintage Penguin is a private server which is set in the really old era of Club Penguin between 2005 and 2007. Whilst it is really old, they have some really cool custom events and it is quite fun, the old era might not be for everyone! You can play it here. Yes, the game is completely family friendly and inappropriate language is not allowed. Recently, there were some rumours that they had done something wrong, which were pushed by trustworthy CPPS developers. No details were given and these accusations were deleted by those who published them and denied by the team. No specifics or evidence has been revealed and other than that, there has been nothing dodgy about them. Q: What’s the next “big thing” on Vintage Penguin? The St. Patrick’s Day event is currently on, though it ends very soon, and there was a Pi Day event a few days ago. There will also be a Puffle Party later this month! Pengur is a private server which went down last year and hasn’t re-released yet. It has a lot of custom designs and they are currently working on something huge: Project Coral! It’s also run by the developers of Club Penguin Rewritten and is extremely trustworthy. Q: Will the game be family friendly? Admittedly, there was a database breach last year when it was around. However, their security has been hugely improved since then. For example, it’s run by the team which ran CP Rewritten, and they never had a single database breach. Q: Why are you blogging about a server which hasn’t even released yet? Pengur is one of the main reasons I’m still so excited to remain in this community as it looks absolutely incredible, yet is still run by a completely trustworthy team! Whilst there might not be that much news for now, I will share anything which gets released! I will also publish news about the game and incorporate it in the blog header when it releases. I understand this can be easily overlooked, but recently, there have been several CPPS database breaches. Following a few simple steps can ensure that none of your information is threatened, even if one does happen. Whilst I can never promise that the servers mentioned in this post will never have a database breach, following those three simple steps will mean you won’t have to worry nearly as much if one occurs. Until then, I hope you will join me on the future of Club Penguin Mountains, now your #1 source for SuperCPPS and Vintage Penguin (and also Pengur)! Thank you very much for reading!